Losing business because of poor record keeping : case study of How MYOB Accounting software helped this business owner get back his customers. Home Our Clients Client List Losing business because of poor record keeping : case study of How MYOB Accounting software helped this business owner get back his customers. Is poor record keeping making you lose your customers, and lose your profits? Using MYOB Accounting system, we helped him integrate the business processes so that his team members can get the clients' information at the click of the mouse, without extra work. This customer is in the service industry, supplying fire extinguishers, mostly to businesses. There are 2 main challenges faced in this business. A. Customer records kept in paper files. He records his daily sales into an exercise book, with one page allocated for 1 day of the month. Each page has columns for invoice number, customer name, invoice amount, date paid and amount paid. When a customer makes a payment, he flips through this exercise book to the page the day the sales was made, and records the date and amount paid against that invoice number. He does not keep a separate ledger card for each customer. Instead he opens a paper file for each customer, and files a copy of the invoice there. Once payment is recorded in the exercise book, he / his staff will go the filing cabinet and look for that customer's personal file, and record the date of payment on the filed invoice copy, and attach the payment advice / bank in slip to the paid invoice. 1. 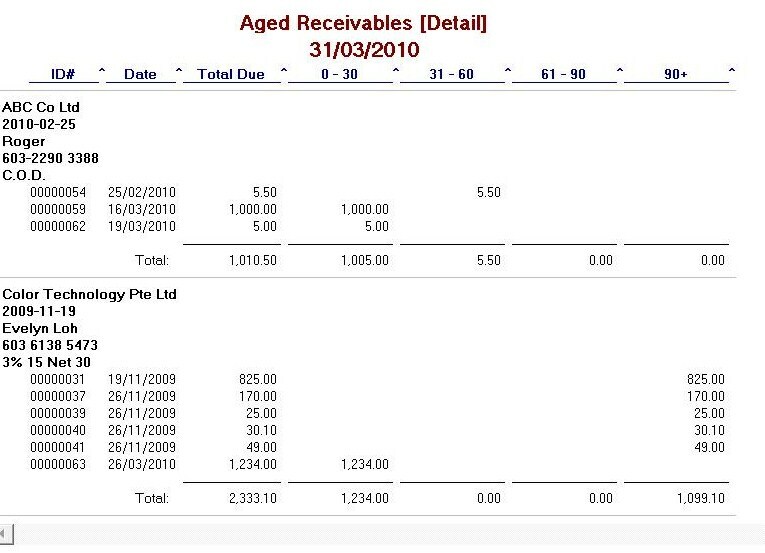 To know which customer has not paid their bills on time, he flips through the exercise book page by page, and then narrow down to the ones with no pencilled amounts under the 'Paid' column. 2. He (or rather his staff) has to tread very carefully when they call the customer to follow up on overdue payments because they can't be very sure whether his recording is correct. As a result, customers lost confidence in his record keeping, and delay paying up until he 'clean up the accounts'. His cashflow got affected. 3. Furthermore, since the business has been in existence for 5 years, there could be one customer invoice recorded somewhere in the many volumes of exercise books which remained unpaid till now! 4. When a customer requests for a statement, the staff has to go through the customer's personal file, and manually key-in the invoice number, amount, and date paid in a spreadsheet, and list down all the unpaid invoices. This takes time to prepare, and is highly reliant on the accuracy of the recording of the payment details on the invoice copy in the file. 5. He could not easily pin-point which customer's maintenance contract is expiring or has expired, except by going through the customer's personal files to look for the last renewal notice. He reckons that his competitors have taken over a fair amount of the service contract from him, although some of his loyal customers did call up to renew with him. He is in the supply of fire extingushers whereby the unit, once purchased requires a yearly servicing. B. Invoices were printed onto a pre-printed invoice format using a typewriter. The staff uses a typewriter to type out the quotation, delivery order and invoice, onto carbonised pre-printed formats. We did not ask why the owner didn't use the computer for this purpose. 1. If there are any mistakes made, the invoice need to be retyped or corrected manually on each copy of the document. 2. Typo errors, especially computational errors, resulting in customer unhappiness, or even underpayment of amount. There is nothing wrong in using Excel, Word or even manually handwriting the invoices to be given to the customer. However, from an accounting viewpoint, that process is not 'integrated' , i.e. it does not automatically update other records, for example, the list of outstanding customer balances, or the stock balances. With MYOB Accounting system, it will probably take the same amount of time to complete the first step - creating the sales invoice - as it does with Excel, Word, or the typewriter. But MYOB system will do much more after that first step. MYOB system will automatically update the sales figure in the Income Statement (or Profit & Loss Statement), and the List of debtors outstanding invoices. It will also update the GST reports (if applicable), and can produce reports of sales analysis by customer, salesmen, and products sold. The invoice can also be emailed or faxed directly from MYOB System, a cost-saving feature often overlooked by most people. When the customer makes a payment, you just have to call up the customer file in MYOB, and allocate the amount paid against the outstanding invoice. MYOB's integrated accounting system will carry out the double-entry bookkeeping behind the scene once the invoice is recorded. we got the staff to enter the customer's details in MYOB Cards List. 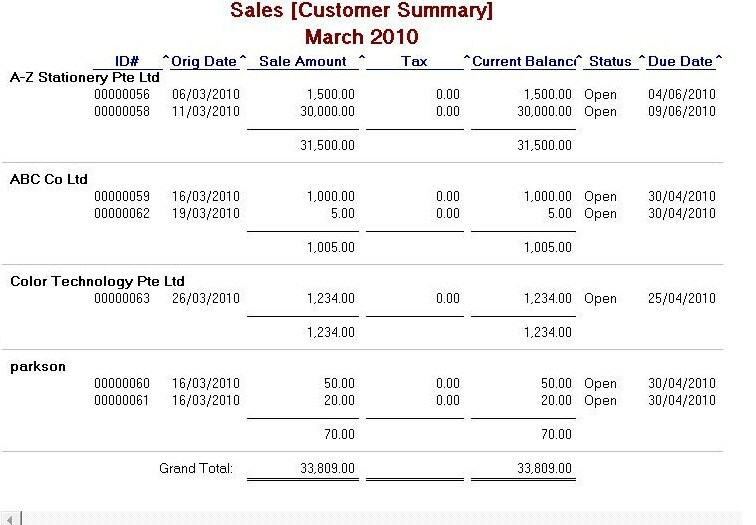 Once she got the hang of entering a few customers' details, we immediately got her to enter that day's quotation using MYOB's Enter Sales function in Sales command centre. Then we got her to print that quotation onto the existing pre-printed quotation form (printed on a dot-matrix printer, which they had to buy new). Quotation is then recorded and stored in the MYOB system. This quotation is then sent to the customer. the staff calls-back the quotation, make changes as necessary, and click 'Change to Order' button to convert the quotation to a delivery order and prints it out. Once the item is ready to be delivered, she clicks on the 'Change to invoice' button to update the customer ledger and to update the stock inventory at the same time. She prints out the Invoice to be given to customer. After the printing is over, we showed her what the customer ledger account, customer aging report and customer statement looked like with just this one transaction record. She was trilled to pieces seeing that the reports can be generated and printed with no extra effort on her part. Best of all, to the the staff, what she did on the computer (i.e in MYOB) is nothing very much different from what she was doing with the typewriter - just a change of medium - from a typewriter to a computer. But the results are very much different. For the invoice billings for the maintenance contract, we also showed her how to save the sales transactions as a 'recurring transaction' and to put a future date for MYOB's To-Do List reminder system to remind follow-up action next year. Next, we started the staff onto keying the customer's balances outstanding as of the first of January. This took some time to complete as she needs to refer to the customer's individual statement that was prepared and/or to paper files of each customer. Once she got the hang of it, we went on to the next task of updating the customer's payments. Based on the bank in slip, we showed how to record the payments received from customers, and how to knock off against invoices entered in step 1 and 2 above. All in, it only took 3 visits for the customer to get used to the new MYOB Sales system. c. list of To Do list for next year's follow up action for the renewal of service contracts. 2. Customers need to be reminded to buy from you. There should be a system to remind you to send out reminder letters for service contracts when due. Otherwise, you are leaving money on the table for someone else. 4. Free up staff's time from doing tasks that the computer can do well. This means that the staff can concentrate on other more important areas, like calling back 'lost customers' and generating income for the Company.